Adding documents to a page (or news, event, etc.) is the same as adding a link to a website or another page on your site. Type the name of the document, or other words you want to act as the link text. In the screenshot below, we use the phrase "My Document." Select the words with your cursor and press the "Insert/Edit Link" button. It looks like a small chain link. Click the "Open File Browser" icon next to the Link URL field. Upload or select the document you want to link to. Some sites may have subfolders within the Documents folder to help with organizing files. If you need a new subfolder created, please email asweb@uw.edu. 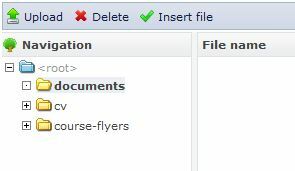 Double-click the desired file or select the file and click the "Insert file" button at the top (next to the green check mark). The path to the file will appear in the Link URL box. Click "Ok" to confirm the link insertion. Save the content and test the link. Click on a word within the current link to the file. Click on the "Insert/Edit Link" button. Upload a new file with the exact same filename as the first file. Be sure you are also uploading it into the same subfolder. If you use the same filename in the same folder, it will replace the old file. If you use a different name, the old file will remain. You may delete it if you wish. Click "Ok" to confirm the link update. Go to the Manage Content screen (second link in the gray toolbar at the top) and go to the Files tab. This gives you a list of all the files users have uploaded to your website. A few files have standalone upload fields, so that they can be displayed as a button, download link, or image. These include CVs (on Profiles), Course Flyers (on Course Sections), and PDFs (on Research). If a faculty member or grad student wants to add other documents on their Profile or Research, they can send those to a department web editor who has permission to insert file links as described above. Does my site have this feature? All Department Web Framework sites now have this interface for managing files. The new approach to file management was piloted on a few sites in summer 2015. The A&S web team began updating existing sites in winter 2016 and finished converting them all in spring 2016.